Today I visited the Sri Lankan restaurant San Rasa (226 Bay Street, Tompkinsville, 718.420.0027) for their Sunday, all-you-can-eat $11 buffet. The restaurant is a short walk from the ferry so it is easily accessible to visitors from the other boroughs. 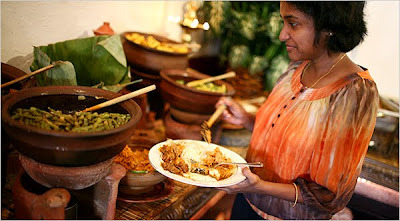 The buffet is filled with traditional Sri Lankan cuisine: curry chicken, oxtail, curried kingfish, eggplant, sweet green beans, rice noodles, yellow rice with cinnamon, hot onion-chili potatoes, and much much more. A delicious mango lassa and mango mousse rounded out the meal and helped to cut the hot spices. I was inspired to check out this place after reading an article in the NY Times last week highlighting the new ethnic restaurants on the Island. You can find the original NY Times article HERE.